A broken down train caused misery for Six Nations fans travelling through to Murrayfield. 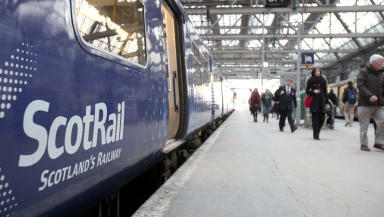 Rugby fans travelling to Murrayfield by train were left frustrated after a broken down train caused a number of delays. A fault with a train at Haymarket forced a number of services to be cancelled on Saturday morning. Timetabling changes required several trains to run with a reduced number of carriages while a number of replacement buses were also operated. A capacity crowd of over 67,000 were expected at Murrayfield to watch Scotland take on Ireland in the second match day of this year's Six Nations tournament. Rugby fans took to social media to voice their frustrations at the disruption. A Scotrail spokesman said: "Due to a broken down train earlier at Haymarket, there is some ongoing disruption to services. "We are doing everything we can to keep people moving, including ticket acceptance with local bus providers and replacement bus services. "Customers should check @ScotRail on Twitter or download the ScotRail app for the most up to date information."